Pest monitoring The beetles damage foliage and bean pods. If foliage feeding is intense at bean emergence, some growers apply an insecticide, though this is uncommon. Specific treatment thresholds have not been established for foliage feeding on beans in the Pacific Northwest. 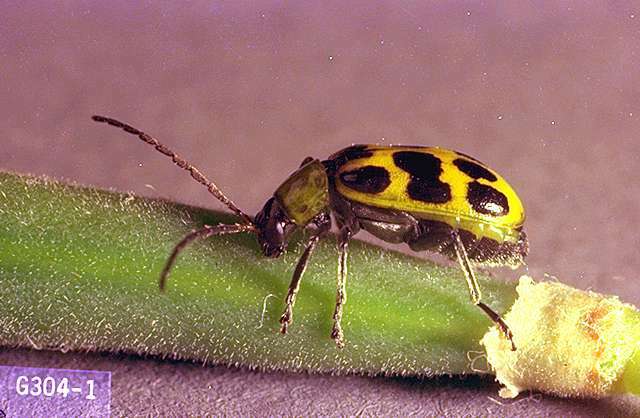 In Virginia, the following recommendation is made: To prevent cucumber beetle damage to seedlings, treat when one beetle per 10 row ft is found. The primary beetle damage in snap beans occurs when beetles feed on developing bean pods. In the Pacific Northwest, a sweep net threshold is used to determine if treatment is necessary at early bloom and the "pin bean" stage. Sweep fields with a standard sweep net just prior to first bloom. When one finds an average of two to four beetles per ten arcs of the sweep net, treatment is justified. This is a very conservative threshold. Be aware of surrounding fields. As grass fields dry down prior to harvest in early July, the first summer generation of western spotted cucumber beetle begins to emerge from the soil. 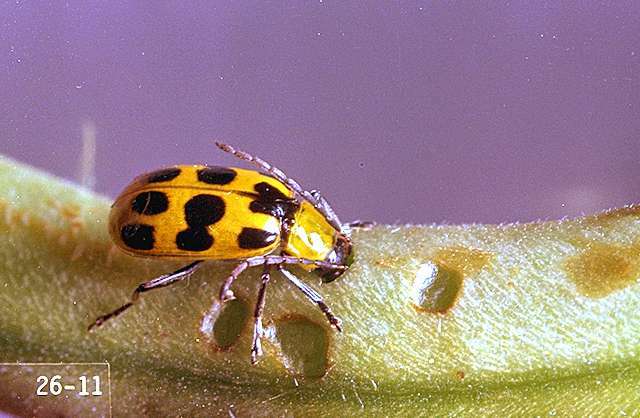 The combination of emerging beetles in a drying landscape can cause sudden surges in beetle pressure in snap bean plantings as beetles migrate into the irrigated plantings from other areas. This is especially a problem starting in late July through August when the first summer generations peak. If sweep net sampling during this period leads to a "no spray" decision, continue to monitor the field through bean harvest. Experimental use of yellow sticky traps placed in the field just above the crop canopy suggests that, on average, if counts exceed one beetle per trap per day, scout the field one week later. If counts exceed two beetle per trap per day, treatment is justified to protect developing bean pods. 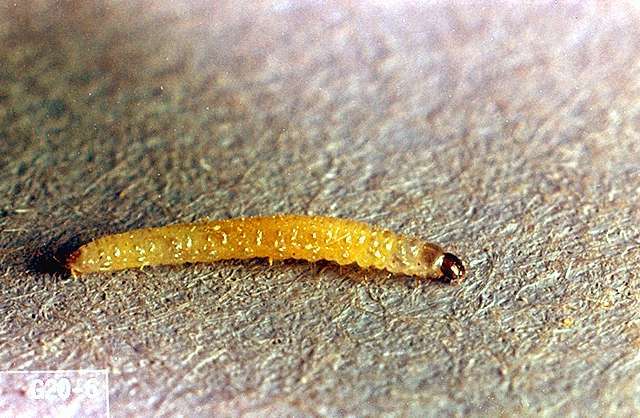 A minimum action threshold has not been established for yellow sticky trap counts. If counts fall below one beetles per trap per day, use sweep net sampling and a sweep net action threshold to make a treatment decision. Watch for beetle invading from the surrounding landscape. In most years, low ebbs occur in the aboveground adult beetle populations after egg laying and before the summer generation emerges. 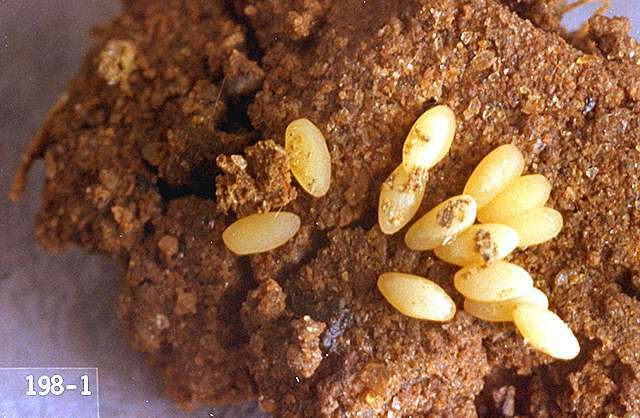 Sometimes, a crop planting can be delayed until after beetles have dispersed and deposited most of their eggs. Trap-and-spray crops sometimes can be used to draw beetles away from the main crop or intercept incoming beetles at the edge of the field. Trap-cropping is an unproven control method in Oregon. permethrin-Some formulations are OMRI-listed for organic use. carbaryl (Sevin 4F) at 0.5 to 1 lb ai/a. PHI 3 days. REI 12 hr. Do not exceed 6 lb ai/a per crop. Retreatment interval 7 days. Toxic in aquatic habitats. Latex-based formulations, such as Sevin XLR Plus, are less hazardous to bees. esfenvalerate (Asana XL) at 0.03 to 0.05 lb ai/a. PHI 3 days. REI 12 hr. Do not exceed 0.2 lb ai/a per year. Do not allow livestock to graze treated bean fields. Do not harvest treated bean vines for livestock forage, fodder, or hay. methomyl (Lannate SP) at 0.23 to 0.45 lb ai/a. PHI 1 day for beans, 3 days for feeding vines, 7 days for hay. REI 48 hr. Do not exceed 4.5 lb ai/a per year. novaluron (Rimon EC) at 0.058 to 0.078 lb ai/a. PHI 1 day. REI 12 hr. Retreatment interval 7 days. Do not exceed 0.23 lb ai/a per season. zeta-cypermethrin (Mustang) at 0.04 to 0.05 lb/a. PHI 1 day. REI 12 hr. Do not make applications less than 5 days apart. Do not exceed 0.3 lb ai/a per season.